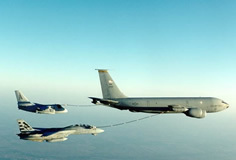 The KC-135 Stratotanker's principal mission is air refueling. This unique asset greatly enhances the USAF's capability to accomplish its primary missions of Global Reach and Global Power. It also provides aerial refueling support to Air Force, Navy and Marine Corps aircraft as well as aircraft of allied nations. Four turbofans, mounted under 35-degree swept wings, power the KC-135 to takeoffs at gross weights up to 322,500 pounds (146,285 kilograms). 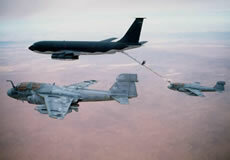 Nearly all internal fuel can be pumped through the tanker's flying boom, the KC-135 's primary fuel transfer method. A special shuttlecock-shaped drogue, attached to and trailing behind the flying boom, may be used to refuel aircraft fitted with probes. 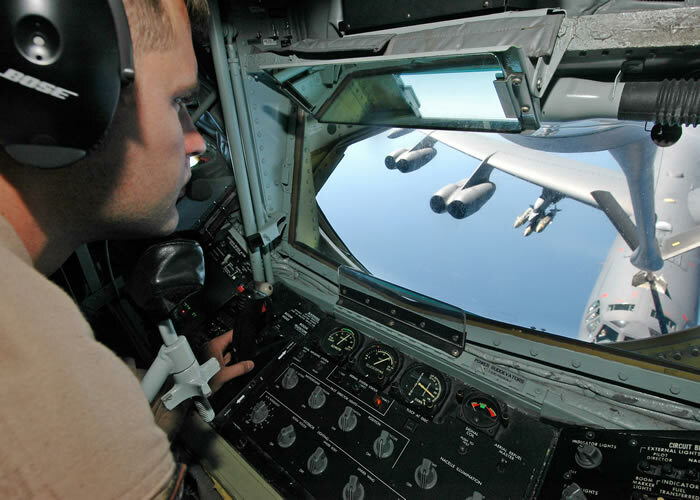 An operator stationed in the rear of the plane controls the boom. A cargo deck above the refueling system can hold a mixed load of passengers and cargo. 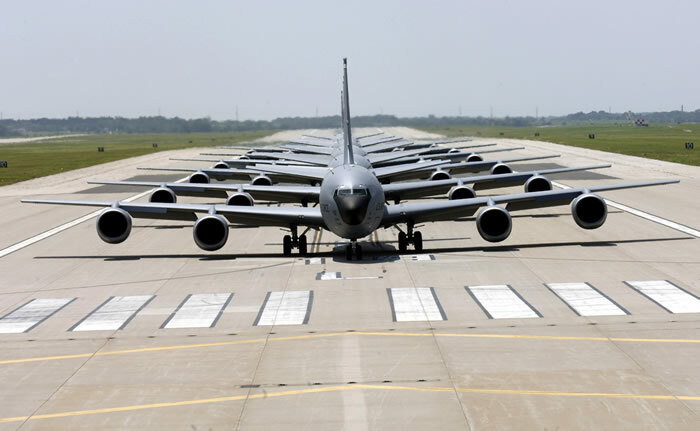 Depending on fuel storage configuration, the KC-135 can carry up to 83,000 pounds (37,648 kilograms) of cargo. In Southeast Asia, KC-135 Stratotankers made the air war different from all previous aerial conflicts. 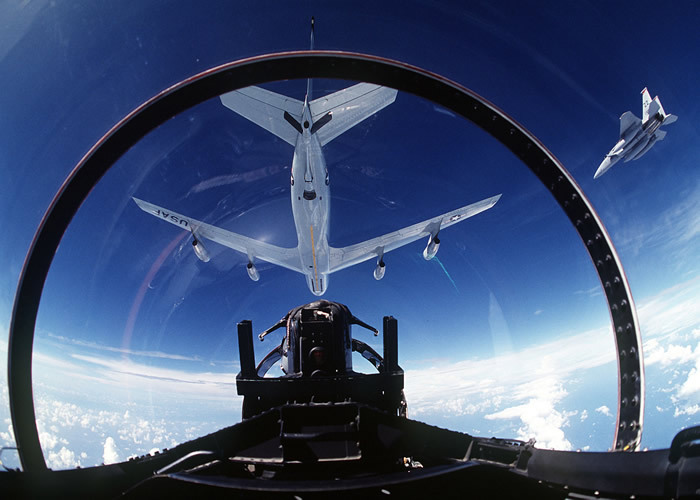 Midair refueling brought far-flung bombing targets within reach. Combat aircraft, no longer limited by fuel supplies, were able to spend more time in target areas. AMC manages more than 530 total aircraft inventory Stratotankers, of which the Air Force Reserve and Air National Guard fly 295 of those in support of AMC's mission. The Boeing Company's model 367-80 was the basic design for the commercial 707 passenger plane as well as the KC-135A Stratotanker. In 1954 the Air Force purchased the first 29 of its future 732-plane fleet. The first aircraft flew in August 1956 and the initial production Stratotanker was delivered to Castle Air Force Base, Calif., in June 1957. The last KC-135 was delivered to the Air Force in 1965. 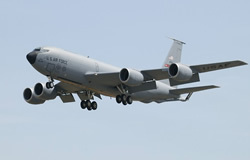 Of the original KC-135A's, more than 410 have been modified with new CFM-56 engines produced by CFM-International. 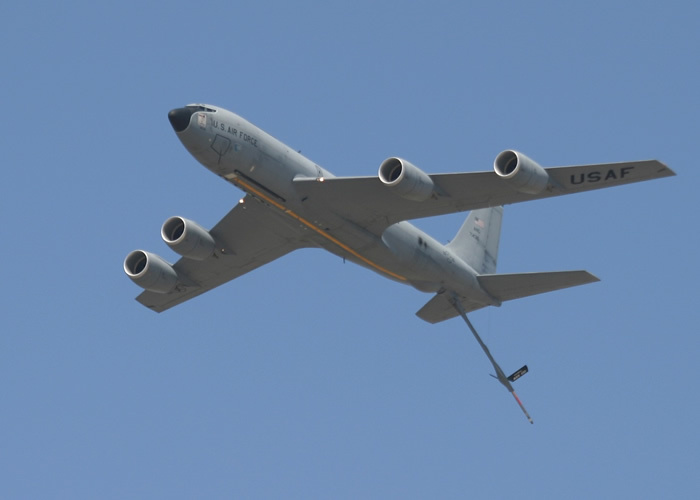 The re-engined tanker, designated either the KC-135R or KC-135T, can offload 50 percent more fuel, is 25 percent more fuel efficient, costs 25 percent less to operate and is 96 percent quieter than the KC-135A. Under another modification program, 157 Air Force Reserve and Air National Guard tankers were re-engined with the TF-33-PW-102 engines. 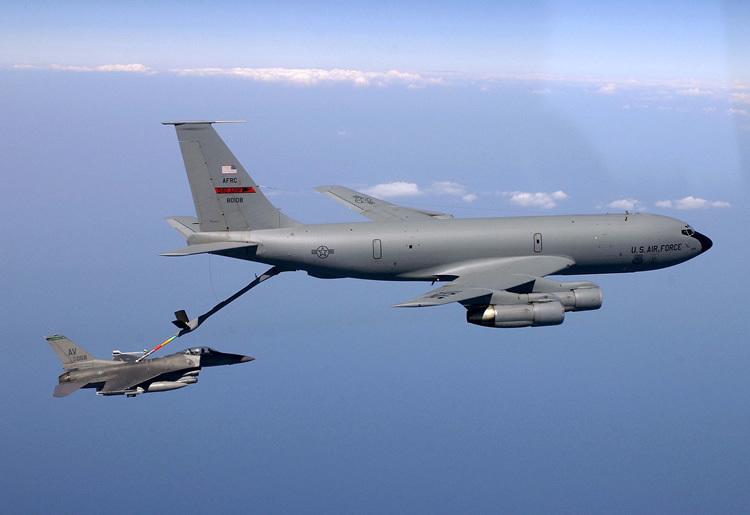 The re-engined tanker, designated the KC-135E, is 14 percent more fuel efficient than the KC-135A and can offload 20 percent more fuel. Through the years, the KC-135 has been altered to do other jobs ranging from flying command post missions to reconnaissance. RC-135s are used for special reconnaissance and Air Force Material Command's NKC-135A's are flown in test programs. 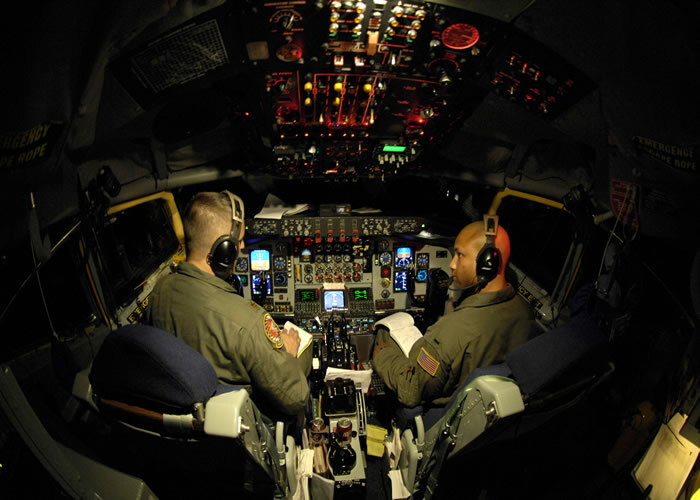 The Air Combat Command operates the OC-135 as an observation platform in compliance with the Open Skies Treaty. Over the next few years, the aircraft will undergo upgrades to expand its capabilities and improve its reliability. Among these are improved communications, navigation and surveillance equipment to meet future civil air traffic control needs. Crew: Four: pilot, co-pilot, navigator, boom operator. Aircraft equipped with PACER CRAG do not have a navigator on most missions. The Air Force procured a limited number of navigator suites that can be installed for unique missions.